Available to order now from £26,195, first UK deliveries of Toyota's new 7-seater Prius+ will take place in July. Official fuel economy figures are 68.9mpg for the T4 and 64.2mpg for the T Spirit. Installing the slim lithium-ion battery neatly within the centre console avoids any intrusion on the space available for rear seat passengers and for load carrying. Five separate folding rear seats are provided and with all of these in place there is 200 litres of luggage space; with the third row stowed, this figure rises to 505 litres. 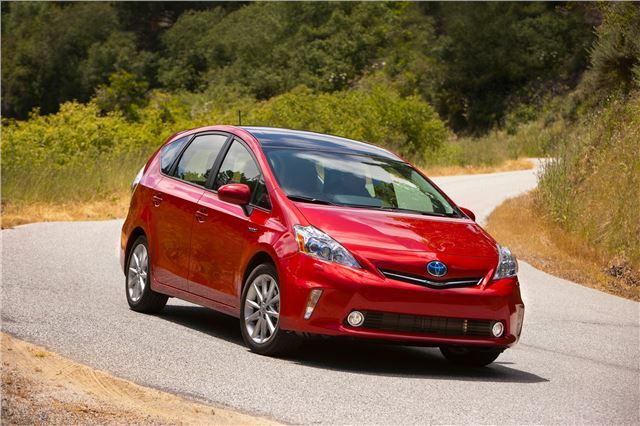 Prius+ is available in two grades – T4 and T Spirit. Key equipment features provided as standard on each model are outlined in the table below. The range of equipment and styling options for Prius+ is awaiting confirmation, but leather upholstery and the Toyota Touch and Go Plus system will both be available for T4 models. Seven exterior colours are available for Prius+: Pure White and Astral Black (solid); Decuma Grey, Tyrol Silver, Vermilion Red and Orion Blue (metallics); and White Pearl (pearlescent). The T4 grade comes with Hayama grey cloth upholstery, with Nagara black leather fitted to the T Spirit.